Our second stay here and even after three weeks we did not want to leave.The apartment is well equipped and the large balcony is a great place to eat and drink whilst watching the sunset or the ships and super-yachts in the port below. The charming Nöelle who lives next door met us as we arrived and is on hand to sort out any queries. Buses down into the city or to Monaco and Menton stop directly outside and are regular and cheap. Nice is a fascinating city with great architecture, museums and galleries, more of which can be found in the surrounding towns and villages, most of which can be reached by train or bus. We shall be returning. My husband and I stayed for a week in May. We loved the apartment. Our hostess Noelle could not have been friendlier, and Bruno, the owner, was very easy to deal with. We never tired of the views. 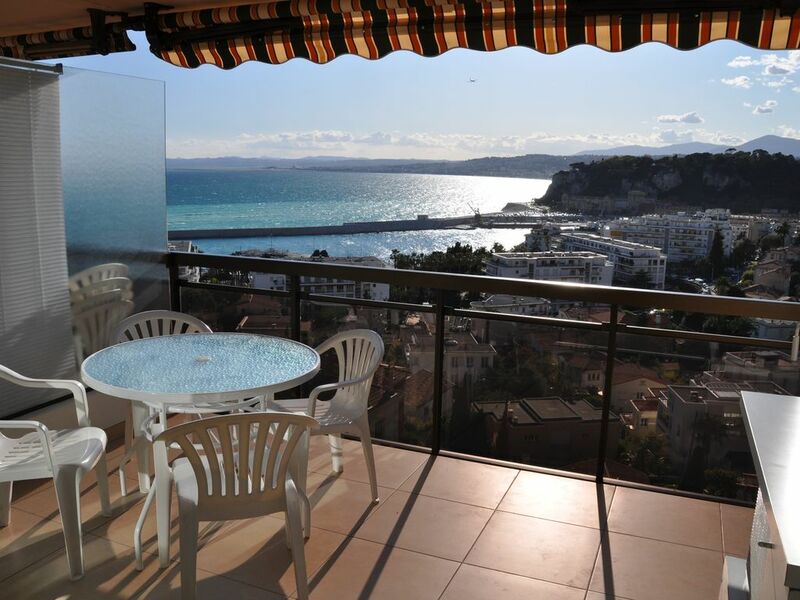 A delightful modern appartment with spectacular views across Nice and its busy port. We recently spent a week at this lovely apartment. It was clean and modern with everything supplied. Housekeeper Noelle (lives next door) gave us a lovely welcome and was available if we had any problems (she also very kindly gave us a lift to the airport). We were lucky with the weather so were able to sit out on the balcony and enjoy the superb views. It's a short walk down to the Port, a bit longer walking back as part of it is slightly uphill, but we enjoyed the exercise!! Of course you can also take the bus which stops outside the apartment. We will definitely return. The apartment was clean and well equipped with a good sized balcony with views over the port, the sea and to Cap d'Antibes. Wonderful sunsets over the mountains and a constant stream of ships and superyachts coming in and out of port. Ten minutes walk down to the port and ten minutes up to the supermarket. Buses stop directly outside and go into the city or as far as Menton. When we went in late September/early October the pool was comfortably warm and very little used. We would certainly stay again. We were 3rd time in this apartment. First of all owners are very easy to communicate and very helpfull. Meeting person Noelle is superb :). Apartment itself is very clean, very well-maintained, has all equipment you need. Has very good Wi-fi connection. The view... it is increadible, you can spent all of your evenings in terrasse. Also it is very important in Nice that you have garage space below the apartments if you rent a car or travel by car. Lacation is very good. Aprox. 300m up the hill there is Carrefour supermarket with undergound praking space. The old town you can easely reach by walking. We very liked restaurants located around Nice harbour. For our family Nice become our home and we definetly will return to this apartment. For sure we recommend this property. Fantastic, cosy apartment on great location. The apartment was in a lovely area, well equipped and everything was there that you needed, we found it great. As a bonus was large balcony with a views of Baie des Anges and town, just perfect to spend the evenings outside. We had a fantastic stay. Ivars, Evita and Anna from Latvia.